Time for a book amnesty. We all own books we never intend to read again. (Most of them courtesy of Iain Sinclair, if we're being honest about the Londonist book shelf.) So, if you want rid of a few tomes, here's a golden opportunity. Donate any book at one of 20 locations in London and a child in Africa gets a new library or school book. Here's how it works. 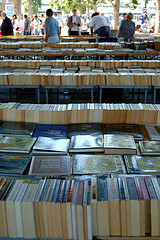 The charity READ International collect books, ship the useful ones straight to Africa, and sell the non-applicable ones online to provide funds for libraries. Any they can't sell are recycled. No donation is wasted. Their current push is in collaboration with Conspiracy For Good, Tim Kring's new alternative-reality game that aims to give Londoners plenty of fun while contributing positively to the world. Whether you're following along with the game or not, donating to this book drive can only be a worthwhile thing. To find out where the nearest drop-off point is, check out this map. The collection ends on 6 August. Bookish image by Su-lin in the Londonist Flickr pool.